1971, under the covers at night, a book called “Haunted Houses” by Aiden Chambers. Frightened the life out of me – I’ve been one of the undead ever since! I’d say start with some short stories – maybe Stephen King’s “Night Shift”, any collection of stories by H.P. Lovecraft and any recent “Best New Horror” anthology. A lot of my favourites tend to fall into the middle section of a horror / SF venn diagram - “science horror”? A non-fiction book published this year: “Unacknowledged” by Steven Greer, about government cover-ups of technology and alien contact. Whether you believe a word of it or not, it’s utterly unnerving. Alex Bell – her YA novels “Frozen Charlotte” and its prequel “Charlotte Says” are seriously chilling. Either James Whale’s 1931 “Frankenstein” or John Carpenter’s “The Thing” based on a novella by John W Campbell. Both manage to capture that sense of ‘otherness’ that makes the original stories so creepy. Nobody’s ever adapted Lovecraft successfully, despite a number of tries. Even “Re-animator,” which is brilliant, is only a very loose interpretation. Without a doubt, the ‘79 TV version of “Salem’s Lot” by Tobe Hooper. Or possibly the last couple of years on the news channel. 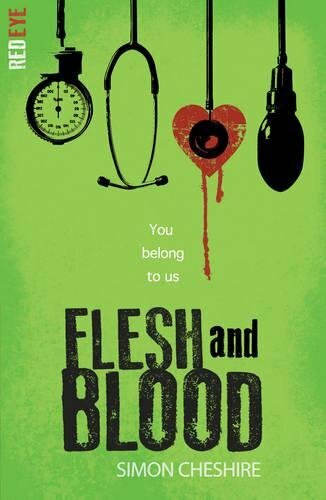 “Flesh & Blood” is actually my first out-and-out horror story. All my work to date has been children’s fiction and non-fiction. I’m continuing with that, but I’m also working on more horror and SF for grown-ups. I think there’s a (slowly) growing realisation that genre fiction of all kinds can and does tackle exactly the same themes as the ‘literary’ stuff. It does the job in very different ways, that’s all. Absolutely. It doesn’t turn up in the form of monsters and demons, of course, it generally wears a suit and tie. Snakes. End of. They’ve got such nasty faces.